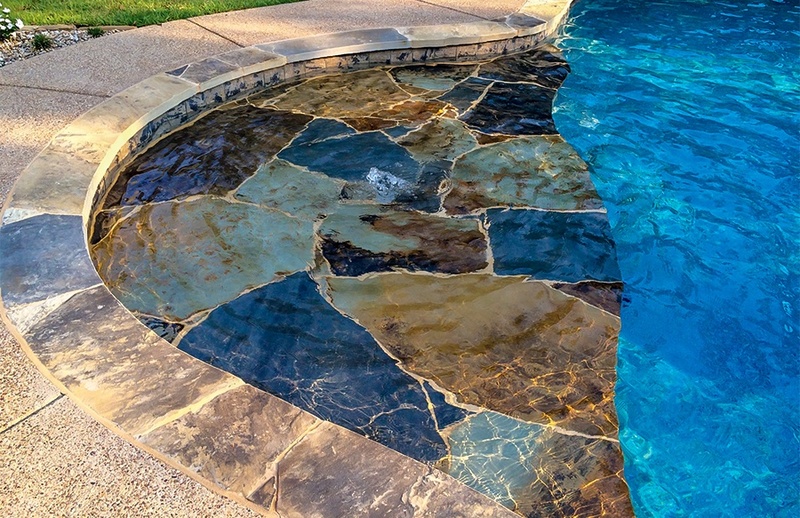 Also known as a Baja step, tanning ledge, lounge ledge, and sun shelf, this feature represents one of most prevalent trends in pool swimming design around the United States. Popularized at high-end hotel properties, a Baja shelf is a solid span inside of or adjacent to the pool perimeter. It resembles a wide, shallow step. This feature typically runs about 4 to 8 feet in length, at least several feet in width, and 3 to 18 inches deep in the water. 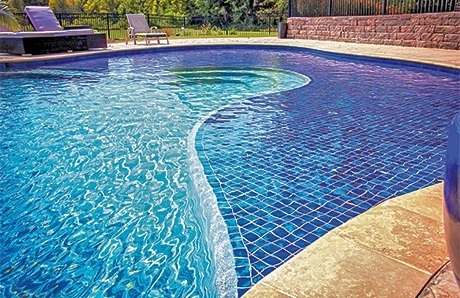 Underwater curves: In a free-form pool, a Baja shelf with flowing lines is a harmonious style match. These dimensions—paired with a shallow depth—make a Baja shelf ideal for lying directly in the water without fully emerging your body. Those built a foot or more deep and 8 feet or longer work well for setting out one or several chaise lounge chairs. 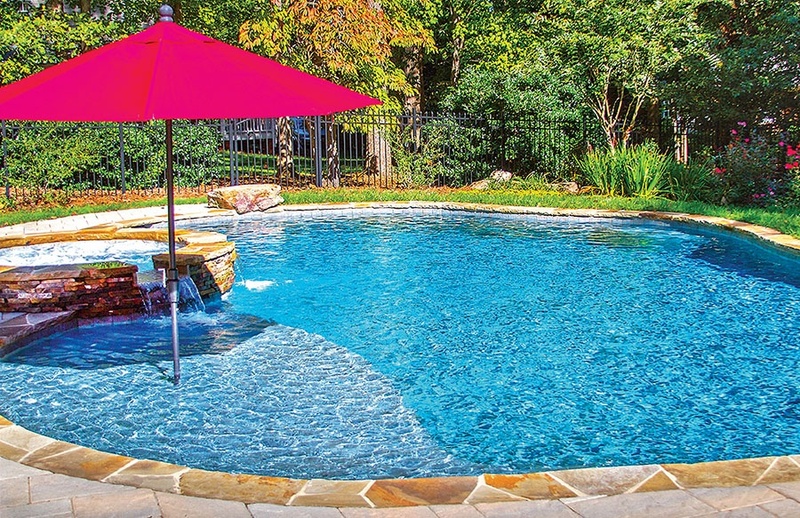 Increasingly, pool owners also incorporate a large patio umbrella to provide shade from the sun. You can also use these partially submerged perches as a supervised play area for small children. Ditto for your pet pooch who likes to cool off in a few inches of water without having to swim. Benefits like these are why thousands of new pools around the country are built with a Baja shelf. 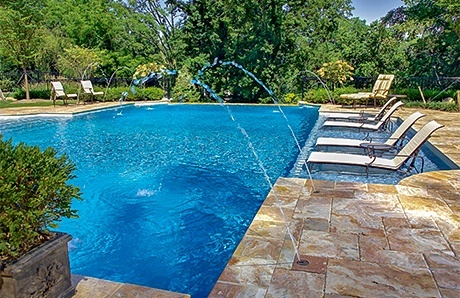 If you are planning a major pool renovation, it’s definitely a smart move to consider this feature for the added functionality and character it will bring to your aging pool. Depending on your style and budget, you have a number of ways to include a great-looking Baja shelf design that integrates with the rest of your pool. The simplest way to design the shelf is to cover its surface with the same interior finish used on the rest of your pool marcite (plaster, color quartz aggregate, or pebble.) This approach—unless other decorative accents are added—creates a more seamless appearance, as the shelf will visually blend in with the rest of the pool. However, you may prefer to create visual contrast—making the feature “pop” to the eye. One way to do this is to cover the shelf’s exterior in flagstone. The particular kind of stone holds up underwater and provides a distinctive aesthetic. Natural look: The decorative flagstone on this Baja shelf provides an appealing appearance that’s a particularly good match for a lagoon-style pool or tropical backyard setting. For a more contemporary style, colorful tile is another option. It’s best to use a non-skid variety, particularly if you have young children who will use the shelf. Smooth cover: This Baja shelf boasts an exterior covered with tile, producing a more modern look. You can also to use the same interior finish as the rest of the pool, but add accents along the shelf’s edge with a few pieces of small tiles. Using a mosaic design in the center of the shelf is also a clever way to provide a visual indicator for the underwater structure. Mosaic markers: Choose from a wide variety of fun, bright mosaic designs to provide a great decorative touch for a Baja shelf. On a new pool, another accent that some builders add to a Baja shelf is one or more bubbler fountains. However, to do so on a new Baja shelf going onto an existing pool is more complex; it will require additional plumbing that comes with greater expense. Now, plastering aside, a Baja shelf will require other building phases and their accompanying costs. Several of the steps are essentially identical to those required for building a brand new pool. Here’s is what’s involved in most remodels that build a Baja shelf in a current pool. We will also cover a less-common approach that—in rare cases—can provide a simpler, more affordable way to integrate this feature. 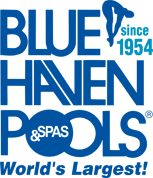 First, your pool remodeling contractor will need to evaluate your pool to see if its dimensions and pool configuration will allow for the space and position that a Baja shelf will require. Most shapes and typical sizes can accommodate one. When construction begins, multiple tradesmen will be executing various phases. After your pool is drained, one crew will chip out your pool’s aging plaster, and another team will start on the Baja shelf. Just like building a new pool, a team of steel specialists will arrive on site. They will install a carefully formed frame of steel rebar to form the bench. Care must be taken to create a structure and shape that will blend into the existing pool wall. Once the steel is in place, another group of tradesmen will bring in a concrete rig—either gunite or shotcrete. They will shoot the wet material onto the steel frame to create the solid ledge. If you would like some shade when using the shelf, then before concrete, the crew will place a tube-shaped form to create a sleeve for inserting an umbrella pole into its flat surface. Once the pool is completed, this sleeve makes it easy to insert a pole and pop open the canopy to block some of those harsh solar rays. Shade your shelf: Include a sleeve for an umbrella pole in your new shelf, and pick any patio umbrella to complement your backyard décor. Finally, the plaster crew will finish off the shelf when they apply a new surface to the rest of the pool. If you have a design plan that calls for covering the flat portion of the shelf with decorative stone or tile, another specialty team will apply the material to the surface of the shelf. 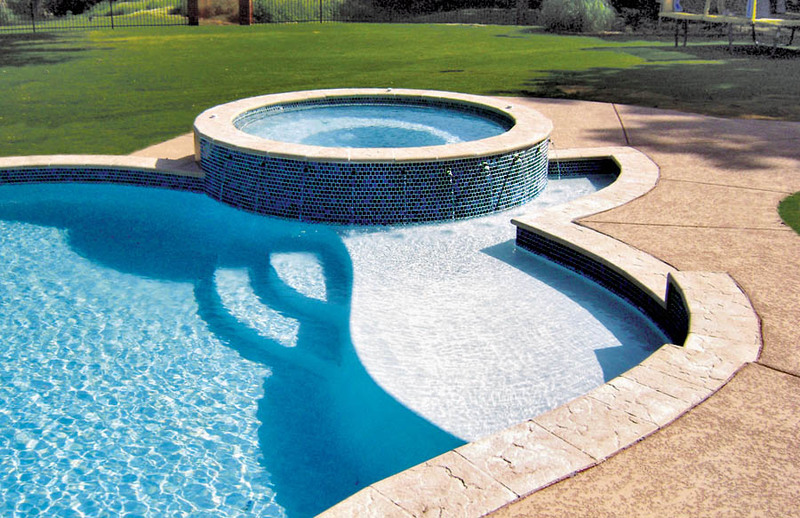 Here’s another idea for adding a Baja shelf: an “exterior build” on your pool’s outer perimeter. This approach is rarely used on pool remodels, since it makes sense only if A.) 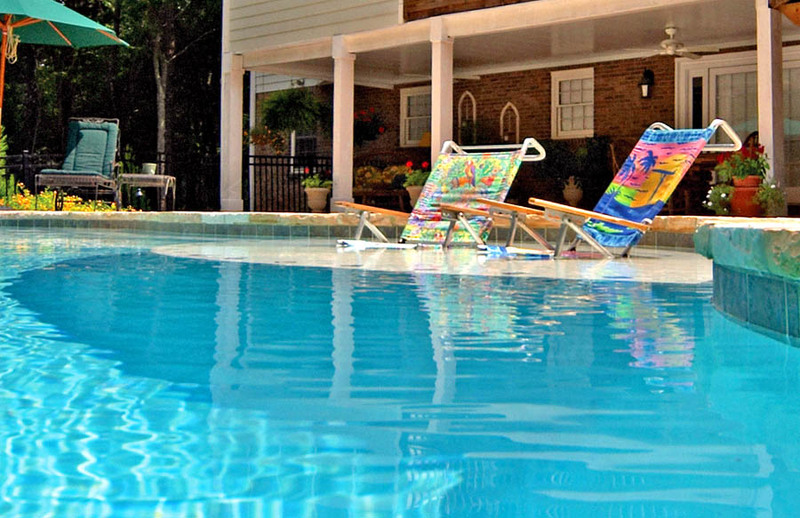 A regular interior shelf will not work on your pool, and B.) The mix of other conditions is just perfect. For starters: Will a regular inside shelf addition work? If so, go the typical route. But, if your pool is very small or has a configuration or features making it tough to seamlessly fit a new shelf into its interior, then an exterior addition could be the solution. This new structure will also give greater visual dimension to your pool’s shape and increase its overall square footage—providing more room for fun and relaxation. However, other variables must be present, too. First, you need the available backyard space for the addition. Second, your remodel plans should already include a total deck tear out and replacement. Third, you have an ample project budget to invest in the needed steel, tile, plumbing, concrete, and associated labor an exterior shelf will require. Exterior addition: This exterior Baja shelf is built deep enough to accommodate lounge chairs. If you can pull off this resort-style addition during your remodel, the ledge will provide added ease, comfort, and functionality for backyard leisure. When it’s time to give your pool a facelift, seize the opportunity. Adding one is also a great way to update your aging pool. Begin the process of knowing your available budget. Be sure you understand if your makeover will include a new plaster and a complete deck replacement, as that impacts the final cost of this upgrade. 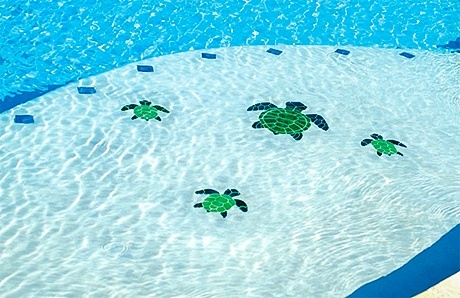 Adding this great feature to your pool can pay off in fun and relaxation for your family.